Janice Cantore is on my list of favorite authors. She used to be a police officer in Long Beach, and that lends a certain realism to her work that I find fascinating. 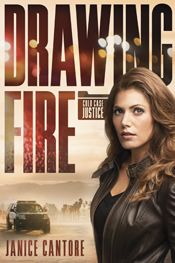 Drawing Fire is the first book in her Cold Case Justice series. Based on this one, I know I'll be reading the rest of the series as well. Cantore writes in a style that I find hard to put down. This book is not an exception to that. I was able to read a couple of chapters and put it down. Then I picked it up again the next evening, and finished the book around 3 a.m.
Abby is a likeable character, who doesn't have everything all figured out. She's a homicide detective, and a good one at that, who really wants to be working a cold case, the case that resulted in the death of her parents 27 years ago. She struggles with this, as most everyone in her life is discouraging her from pursuing the case. Is this vengeance? Is it a sign that she doesn't trust God? Her fiance is away on a missions trip, and they keep arguing on Skype. He thinks she is obsessed, and he thinks she should join him in work that really matters on the mission field. I don't know that this was supposed to be a theme of the book, but it is an idea that I kept coming back to. Can you serve God as a cop? Or a bank teller? Or sitting in a cubicle? Or do you need to be out there "doing ministry" in a more official way. I know the answer to that. Bloom where you are planted, serve where you are. This story, though, had me thinking abut whether we truly believe that. And do we treat people like Abby like they are capable of serving God in their daily lives?